It’s probably the most analyzed, dissected and debated movement of any sport. One person likes Tiger Woods’ swing, another person hates it. One person likes Sergio Garcia’s swing, another person hates it. One person likes Ben Hogan’s swing, another person hates it. So is there ONE perfect golf swing? Well, it depends on how you define a perfect golf swing. If you look at the aesthetics of a golf swing then no, there is no perfect golf swing, because everyone has a different opinion. So let’s look at this in a different way. You go to the PGA Championship driving range, which has arguably the best field in golf. And you go to the practice range to watch the best golfers in the world hit balls. If you did that you would quickly notice that all of them hit it great. You could have Jim Furyk hitting shots next to Rory McIlroy, and although Rory will no doubt be hitting it further than Jim, you’d notice that Jim hits it straight, far and consistent. So would you swap your golf swing for Jim Furyk’s? If you just looked at the swing without seeing the result, most people would not swap their swing. But when you see the result of the swing, any amateur golfer would happily swap their swing with Jim’s. What I’m saying is that the results matter, not the way the swing looks. But here’s the problem for the average golfer when it comes to the golf swing. Jim Furyk has hit thousands of balls to groove his unorthodox swing so that he hits the ball long and straight. Equally, so has Rory McIlroy. There would NOT be a player on the PGA Tour that hasn’t hit thousands of balls. So you could reasonably say, to hit the ball consistently long and straight then you need to hit thousands of balls. That’s a fact (but there is a shortcut, stay tuned for that). The amount of balls pro’s hit is common knowledge. And sadly a lot of amateur golfers wrongly think they need to just hit more golf balls too. But they’re wrong. Because if you were to just hit more balls you would not get better, and in fact, you would probably just get worse. Because by practicing more you would just make your bad habits even more ingrained. You see, for the pro’s, even though some of them have funny looking swings, they have figured out what it takes for them to return the club to a good impact position time after time. If you haven’t figured that out yet, then just beating balls is not going to help you. Instead, if you really want to improve your ball striking you need to change your swing and then practice more (again, I have a shortcut). To change your swing you need to…..
2. Groove that swing over and over again. Then you need to groove that new swing over and over again, so that out on the golf course you just automatically swing great. So there is a perfect swing for you, you just need to find it. Everybody is an individual and every swing is individual. A perfect swing for someone else will not necessarily be a perfect swing for you. So there’s not ‘one’ perfect swing, but there is a perfect swing for you. I’m sure this all makes complete sense to you, but there’s a couple of big problems. 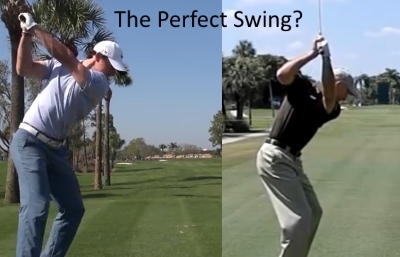 The first is how are you meant to change your swing so it’s perfect for you? And the second is how are you going to find the time to hit thousands of balls in order to groove that swing into a habit? Well, I’ve discovered a massive shortcut to both of those problems. And I have put together a new program to teach you how to find the perfect golf swing for you, and then groove that golf swing over and over again in the minimum amount of time. There is nothing out there like this new method of improving your golf swing. It’s a revolutionary breakthrough in golf instruction. So if you want to FINALLY hit the ball longer, straighter and more consistently without the need to hit thousands of balls, go here to find out more.